It’s still candy. Technically. It feels weird to throw away but it feels even worse to eat. The best strategy? Buy candy you love to hand out to trick-or-treaters so that you can revel in the leftovers! $0.20/kg taffy, now that’s bottom tier, you might as well just throw it away before even bringing it home. Then again I’m not familiar with the trick-or-treat ways of…. well, this millennium. My outskirts home only gets a visit or two per year. I love all three of ’em, and yet I wouldn’t eat a kitkat or a coffee crisp. I may be from Bizarro world? 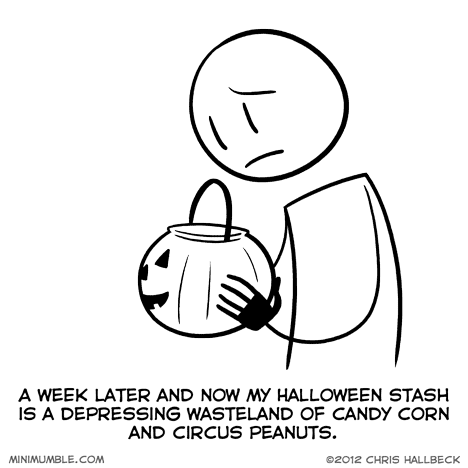 I still have quite a bit of candy, because I was only one of about ten houses on my entire street giving stuff out. If you don’t want your candy corn give it to me! I love the stuff!…GIIVE IIIT TOOOO MEEEEE! Candy Corn and Circus Peanuts are both A tier. IDK what you guys are talking about. The best part of October is all the stores start carrying candy corn in the Halloween section instead of the ludicrously overpriced stuff over by the bulk buy.